It's artistically stimulating for us to experiment with new to us techniques and equipment. We recently revised mono-printing with a commercial printing plate called a gelli pate. First we gathered our supplies. That's the gelli plate in the top left picture. Acrylic paints, stencils, stamps, things to press into the paint and brayers rounded out the gear. 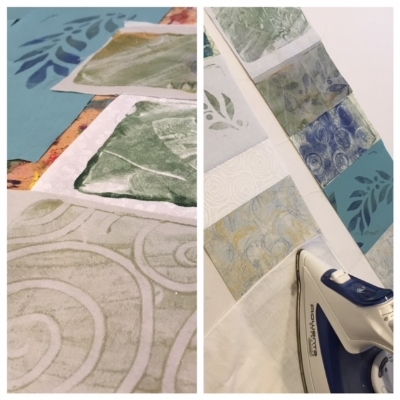 After printing the fabrics we arranged them like a collage artist would do with papers. Adding details of overlapping fabrics and hand stitching was super fun. And we ended up with this finished product! Read more about it on "peace and healing" stole collection on our website here. This took us back to several years ago when we did mono printing off of a homemade gelatin block. I recently dug into that fabric stash and put together this lively table runner. It's in our Etsy shop here! Mono-printing is instantly gratifying. We're pleased with the results and hope to do more of this in the future!